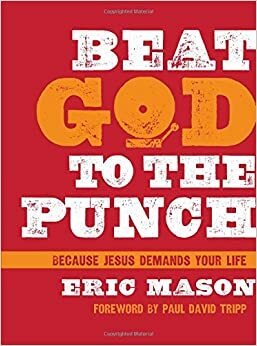 Pastor Eric Mason recently released his newest book, Beat God to the Punch: Because Jesus Demands Your Life, which is a book about coming in contact daily with the freedom that comes through Jesus finished work on the cross. The idea behind such a bold title is meant to draw the reader into the complexities (and simplicity) of a grace-filled life (1). Pastor Mason starts the book off with Philippians 2:9-11, which makes it clear that eventually all will bow to Jesus either by choice or by force. Mason does clarify that beating God to the punch is never accomplished through our own effort, enlightenment, strength, or power, but only through the grace of God is one able to bow. He shows how God saves us from something, but also saves us for something (7). Throughout Scripture we see this idea of Kingdom being in part here now and complete later. This book is for those that have a desire to thrive in the Kingdom of God right now. Mason clearly and articulately walks one through what it means as a follower of Jesus to continually abandon your own life and plans in order to pursue Jesus fully. By embracing this type of lifestyle we enter into a lifetime of apprenticeship with Jesus. This does not guarantee an easy life that is free of pain and suffering, but a life full of God's grace that will sustain us through all things that we endure. This is a short book, just over 100 pages, but a book saturated in the grace of God. Although one can easily read this book in an afternoon, I recommend using it as a supplemental book to reading the Word as a way to spend time learning about how the grace of God enables one to beat him to the punch. I highly recommend this book to those that have surrendered and those curious about what it means to fully surrender to the Lordship of Jesus. For a taste of this book you can read my post from Monday, which is a dozen or more notable quotes. And be sure to check back on Friday and enter to win one of two FREE copies that I will be giving away. What is the Church? vs. Who is the Church?